Whole Brain Learning | Speak Italian Magically! What if you listen to, read and speak Italian at the same time? I have to admit it, I read more non fiction than fiction books…but what counts is that I read, someone would say. Recently I have “read” a special book. Its title is “Lettura+Ascolto” [Reading+Listening], by Maurizio Falghera. Why is it a special book? Well, because it’s a book to read and listen to at the same time, just like most of my books. What do you need reading and listening at the same time for? That’s what the author wants to explain in the easiest way. And he does it in a simple way, although he still quotes authoritative sources and experiences. One among many was very interesting for me and I quote it below from the original source found on the internet. I have always thought that adding a sensory channel (in this case the auditory channel) to what you do, reinforces the experience and speeds up the learning. That’s why I’ve often tried to get the audiobook (the unabridged version) for the books I read. Simply because it gives me a much deeper experience. And in creating my books, I always read aloud and record the texts, so that you have a multilevel learning experience, a whole-brain learning experience. Yes, because if you use my books in the way I suggest, you will have the opportunity to relax while listening, to read and listen at the same time to absorb their content, words and expressions, as well as the conveyed skills. 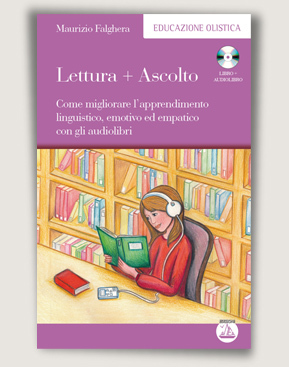 Lettura + Ascolto is a nice non fiction book, aimed at Italians (so the level is very high) that allows you to experience what it talks about in the same moment when you read and listen to it (it is available as book with mp3 CD; and audio-eBook versions). One thing which is not mentioned in the Lettura + Ascolto book and it’s what I consider to be the next step in the learning process. After you have listened to the book, after you read it and listened to it, it’s time to get in the more active phase of the learning. And how can you do it? Well, you can for example use a technique that many international polyglots use very often: shadowing! You don’t know what shadowing is? It’s a technique that consists in speaking “fluidily” and (almost) at the same time, by saying the same things that you listen to. It’s good for you to know that there are several ways of practising it and in any case I suggest you do it first only after listening to and then after reading and listening to the audio you want to practise it with. If you asked me why you should practise shadowing, I could answer you with what they write at Prudl. What if you think you’re stuck with the learning of Italian? You’ve been listening to a lot of Italian, you’ve read a lot of Italian, you are now starting to understand what is being said to you in Italian…But when are you going to speak Italian with confidence? And how can you accelerate your process toward fluency? Before answering those questions, let me guide you to your past, remote or recent, when you were a little child (like my son in the picture on the left:-) and you didn’t speak anything. You didn’t understand anything of what was being said to you. After some time, more or less, depending on how stimulating was your environment and on other factors, you began to understand what your parents - or whoever was taking care of you - was telling you. At the beginning you started to understand because of the gestures, because of the tone of the voice of your caretakers. Then you started to understand some words. So you realized what your mummy was meaning while saying “pappa” (the word usually meaning food for babies), maybe because you associated it with the things that were around when your were going to have “pappa“: your mummy (your dad, or whoever was taking care of you) had always a spoon, you were wearing “un bavaglino“, you were sitting on “un seggiolone” and you were fed with “la pappa“. And finally when your mother was saying “è ora di mangiare la pappa” you realised what “pappa” meant. And this process went on and on until you managed to understand a lot of more words. After a while during this process you started to utter some little words, such as “mamma”….”papà” and then syllables of other words, which soon became complete words and little sentences wit a proper meaning. And before you realized it, you were speaking your mother tongue and you reached fluency in it. If you were a child, like I was too, it may have taken 4 or 5 years to do it: you were speaking your mother tongue without having studied anything about grammar. Because, I guess you started with grammar only when you went to school, didn’t you? While reading the text of this page on your device- pc, phone or tablet - you’re an adult now and you may not want to spend all that time (4 or 5 years to reach fluency! ), but please follow my line or reasoning. Focus on the process you went through while learning your mother tongue. In the end you worked on grammar. So what, Antonio?, you may be saying. Well, over the years I have been reminding myself and my students - especially the ones who tell me that they began to understand the language but they don’t speak it yet - that grammar has to come later in the process. And that if they stick with what they have been doing, they can - and you can - move on with the process towards fluency in the Italian language. Of course, there are ways to accelerate the process and I am convinced of the fact that adults can learn faster than children if they just let go of their fear of making mistakes and stick with a method that involves all of their brain. So, you can reach fluency faster than a child, in less time. But how? One of the key points is to involve all of your brain while learning. Learning on your whole brain is possible if you use a multisensory approach and multi-stimuli approach. Anyway, if you reached the point where you understand a lot of what is being said to you, I guess it’s time to speak! And how can you speak the language? At least in three ways, two that you can practise on your own and one with at least another person. Which one do you prefer?